Worship services at Grace focus on receiving the forgiveness, mercy, and grace of Christ Jesus. Before God, we are sinful beggars who deserve nothing. But on Sunday mornings, we rest assured in God’s forgiveness and gracious presence as Christ comes to us in the preached Word and in His body and blood in the Lord’s Supper. We offer a traditional liturgical worship service based on the Orders of Worship from the Lutheran Service Book. Our services focus on Biblical doctrine and are based on the historic liturgy, confessions, and hymnody of the Lutheran Church. Like many congregations, Sunday is the highlight of our week together. Our worship style is liturgical, blending the church’s musical heritage with newer hymns and music. Our worship is Spirit-filled and we relate it to life in a way that makes it relevant. 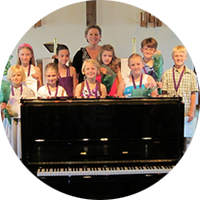 Children’s sermons and special music enhance the service. Our worship is always Christ-centered, celebrating our relationship with the Savior. Communion is offered on the first and third Sundays of the month and on special occasions. Worship begins at 11 a.m., and Sunday school begins at 9:45 a.m. We offer Sunday school for children and a Bible class for adults. Periodically we offer a Christian doctrine class that is taught by the pastor. We believe Christian life is life together, and we are working to make that spiritual reality a lived one. Our Community Events are great examples of how we do this. Whether we’re having a pool party, going bowling, or watching a movie in the fellowship hall, our events are a great place to meet people! Similarly, our Second Sunday Lunches offer an opportunity to get to know one another over great food. After church on the second Sunday of every month, we go out to a local restaurant for a meal and enjoy fellowship together. We welcome you to visit us in person! We would enjoy getting to know you and would appreciate the opportunity for you to get to know us. Above all, we would hope that through us you’d come to know the word of God and continue to worship with us regularly. Interested in finding more than just a church? At Grace, we have several educational programs for adults and children in addition to our weekly Sunday services. Check out our Education page to learn more or reach out to one of our Stewards for more information.